Valiant is proud to debut the first official image of star Michael Rowe in costume as MI-6’s master assassin – Colin King aka the lethal Ninjak – from Valiant’s upcoming TOP-SECRET, LIVE-ACTION project to be announced at New York Comic-Con 2016 (NYCC) on October 8th! 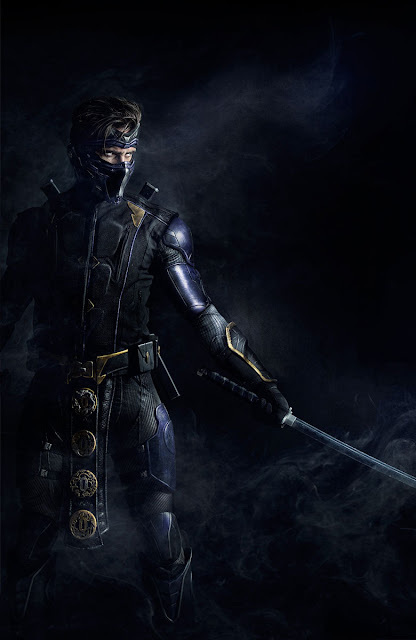 Valiant’s first-of-its-kind, feature-length original digital series – directed by Bat in the Sun’s Aaron & Sean Schoenke, the co-creators of the massively successful YouTube sensation Super Power Beat Down – will feature Ninjak’s brutal live-action debut as he goes head-to-head with a top-secret roster of Valiant’s most iconic heroes for a bloodstained battle royale. Additionally, Valiant can now confirm two new additions to the project’s star-studded cast in actor Kevin Porter (Dodgeball) and actress/model Ciera Foster (Straight Outta Compton). Porter and Foster join lead actor Michael Rowe (CW’s Arrow, The Flash) alongside a prestigious and rapidly growing cast that also includes Jason David Frank (Power Rangers), John Morrison (WWE, El Rey’s Lucha Underground), Derek Theler (ABC's Baby Daddy), and Chantelle Barry (90210, Entourage). The secrets behind Valiant’s highly anticipated, high-octane series will be revealed on October 8th, 2016 during the VALIANT x BAT IN THE SUN: TOP-SECRET PROJECT panel presentation, only at New York Comic Con 2016! Be there as Valiant CEO & Chief Creative Officer Dinesh Shamdasani, Associate Director of Digital Media & Development Josh Johns, and directors Aaron & Sean Schoenke join stars Michael Rowe, Jason David Frank, Derek Theler, Chantelle Barry, Kevin Porter, and Ciera Foster – plus a special guest appearance by John Morrison – to unveil an exclusive first look at footage from Ninjak’s bone-breaking live-action debut. Fans in attendance will receive an exclusive giveaway item available only at Saturday’s panel, which will then be followed by an all-star cast signing at the Valiant booth (#1635). Not at NYCC? 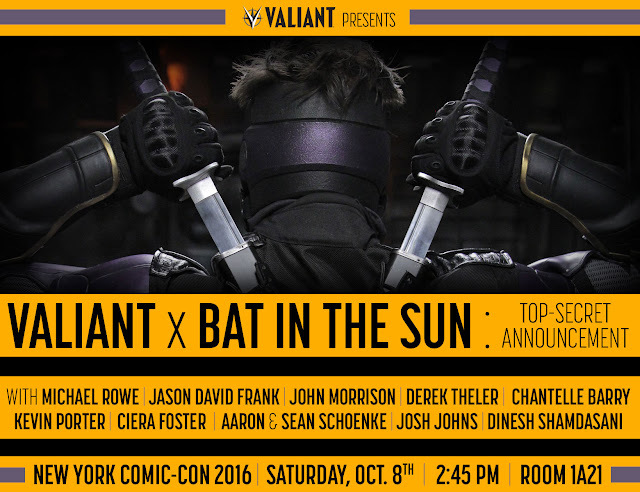 Never fear, because fans worldwide can follow all of the major news and announcements live from the VALIANT x BAT IN THE SUN: TOP-SECRET PROJECT panel presentation live on Twitch's Hyper RPG channel at twitch.tv/hyperrpg! Don’t miss a moment of the action as Ninjak steps off the comic page and into Valiant’s first original series, right here with Twitch's Hyper RPG!